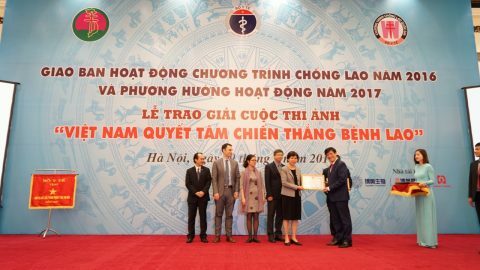 Hanoi, Vietnam – On March 29, 2017, KNCV Tuberculosis Foundation in Vietnam was honorably received the Merit Award from Vietnam Ministry of Health for its significant contributions and assistance to the implementation of the National Strategic Plan on TB control in Vietnam for period of 2014-2016. The ceremony was held as a part of NTP 2016 Annual Review Meeting on March 29, 2017 with representatives of the MOH leaders, MOH related departments, Ministry of Planning and Investment, Ministry of Public Security, Ministry of Defense, NTP leaders and technical working groups, provincial TB Units from 63 provinces, Mass organizations (Women’s Union, Farmers ‘Union, Vietnam medical and pharmaceutical Association, TB and Respiratory Association, …), WHO, French Embassy and other international partners. Dr. Nguyen Thien Huong – KNCV Country Representative and KNCV Vietnam team attended this Meeting and received the Award.